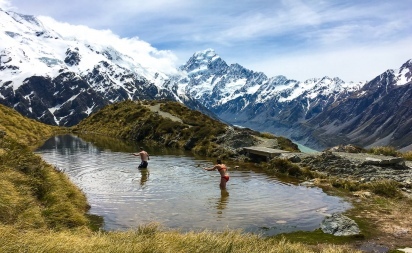 We take great pride in showing guests around New Zealand so it’s second nature for us to do our part in taking care of where we live, work and play – this is our backyard after all. We tread as lightly as we can in all aspects of how we operate and enjoy rolling up our sleeves to partner with local environmental groups in helping make a real difference with and in our community. It began with a Queenstown couple, Neil and Barb Simpson, who had the vision to restore Pig and Pigeon Islands and create a refuge for native birds around Lake Wakatipu. In 15 short years, with the help of hundreds of volunteers, they painstakingly reforested the once bare and weedy islands and transformed them into a lush haven for native insects and wildlife. As a result, buff weka, chicken-sized flightless birds that are classed a “vulnerable species” were able to be successfully introduced to the islands, a long swim away from predators on the mainland. In 2013, the Simpsons received enough funding to form the Wakatipu Reforestation Trust and can continue their efforts protecting and restoring the native biodiversity of the Wakatipu Basin through collaboration, education, advocacy and revegetation projects. Members of our Trails team volunteer each month at their Wednesday morning nursery sessions to help with potting up, seed germination, weeding, building, and maintenance. It’s a pleasure to be part of growing native plants that will be used to restore a variety of native ecosystems found around the Wakatipu, the beautiful place we’re lucky enough to call home. We’re also looking forward to getting stuck in at Wakatipu Reforestation Trust’s Autumn planting day at Whitechapel. It’s a site that runs alongside the Queenstown Trail, where we take many of our guests biking during their trips, and we’ll be able to watch the transformation in the coming years. Okarito, a settlement on the West Coast of the South Island, may only boast a permanent population of 30 people, but this tight-knit community has a big heart when it comes to conservation. Nearby Okarito Lagoon is a tidal estuary that is home to rare birds such as the large white heron and Okarito brown kiwi. In 2014, the townsfolk took over a native tree nursery originally set up by the Air New Zealand Trust and previously run by the Department of Conservation (DOC) in order to continue raising seedlings needed for protecting and restoring the area’s native wetlands. Residents, including local schoolchildren, all lend a hand in the community project by tending to native plants including manuka, totara, rimu, mahoe and broadleaf griselina in the nursery. Okarito is one of our favourite spots on the South Island, and we have a couple of team members who are lucky enough to live there so a regular part of their work week is helping out at the nursery. Our guides and any interested guests also enjoy pitching in during trips that stay in Okarito. The goal of Travelers Against Plastic (or TAP) is to get travelers committed to reducing and eliminating their plastic footprint while traveling, avoiding billions of disposable water bottles around the world each year. 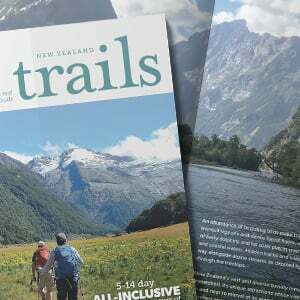 New Zealand Trails has chosen to support TAP by pledging to promote sustainable tourism by reducing plastic pollution, to find alternatives to single-use plastics and to spread the word to travelers and operators, to inspire them to follow in our footsteps. Get in touch with us if you’d like to get involved during your trip, or would like to make a donation to support the important conservation work of these groups. When is the best time to visit New Zealand? We examine each of New Zealand's four seasons and talk about what you can expect in each one.